The federal government is supporting the groundbreaking work of another biotech startup in Alachua County. The USDA has awarded a $500,000 grant to Pheronym, which works out of the Sid Martin Biotech Incubator. Thank you Tim Hammerich for hosting us on Future of Agriculture Podcast and the opportunity to talk about the science behind our nematode bioremediation technology and cost-effective environmentally friendly pest control for farmers. To listen to the Future of the Agriculture Podcast, click on the link. 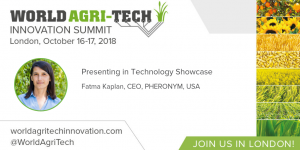 DAVIS, California, and ALACHUA, Florida, August 21, 2018 – Pheronym, a bio-ag-tech pest control company, has been awarded a $500,000 USDA-AFRI (United States Department of Agriculture – Agriculture and Food Research Initiative) multi-institutional research grant to expand its breakthrough insect control and nematode bio-remediation technology to other nematode species. 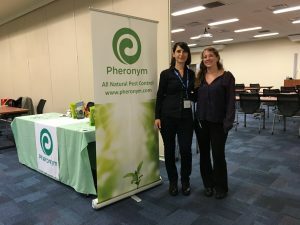 Pheronym uses its proprietary pheromones to control entomopathogenic nematodes (EPNs or beneficial nematodes) for insect pest control and plant-parasitic nematodes, providing farmers with more cost-effective and environmentally friendly pest control. “I have conducted research on EPNs for over 20 years. Using Pheronym’s chemical signals to enhance nematode dispersal—leading to increased infection in insects—is an extremely exciting concept. 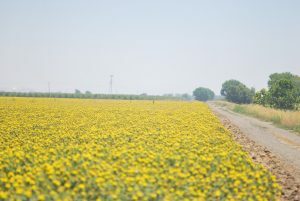 I feel it has exceptional promise that we will explore for greatly improving EPNs’ efficacy,” said USDA-ARS partner Dr. David Shapiro-Ilan and Project Director for the grant. 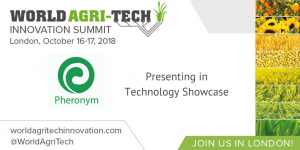 About Pheronym: Pheronym is an ag-biotech pest control company which enables pesticide-free farming, based in ALACHUA, Florida and DAVIS, California. The company’s bio-remediation process uses a new pheromone to control plant-parasitic nematodes (microscopic roundworms) in an eco-friendly way and also beneficial nematodes’ efficacy to eliminate pest insects.  Learn more at http://www.pheronym.com. 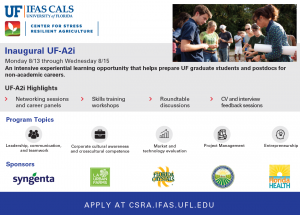 We are very honored to be a featured speaker at the Inaugural UF-A2i Symposium by Center for Stress Resilient Agriculture at the Straughn IFAS Extension Professional Development Center, Gainesville, FL. My talk about “Working for startups” at 3 PM on August 15. 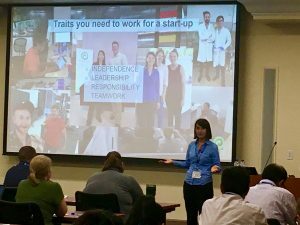 I had a very enthusiastic group of students and postdocs who had many questions about startups. Pheronym CEO, Dr. Kaplan, and Lab Manager, Ms. Gentil-Perret, at the A2i Symposium at UF. We have successfully completed the proof of concept trials for our first product, Nemastim, which is now ready for customer demonstrations. We could not have done any of it without entrepreneurial catalysts: mentorship programs, incubators, and accelerators. In biology, enzymes are biological catalysts that lower the high energy barrier in a reaction. Enzymes lower the activation energy to speed up the reactions. Incubators, accelerators, and mentorship programs are entrepreneurial catalysts. They speed up technology development by lowering barriers such as funds, infrastructure, keep reading. 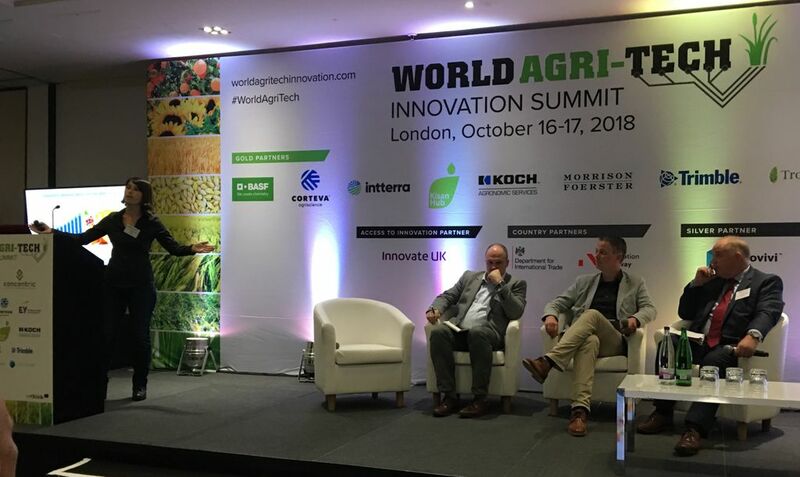 Our co-founder Karl C. Schiller is listening to Brazilian farmers’ problems and presenting our exciting technology for agricultural pest control in Fresno, CA. We would like to thank Germinare for organizing this event and giving Karl an opportunity to talk to Brazilian farmers.